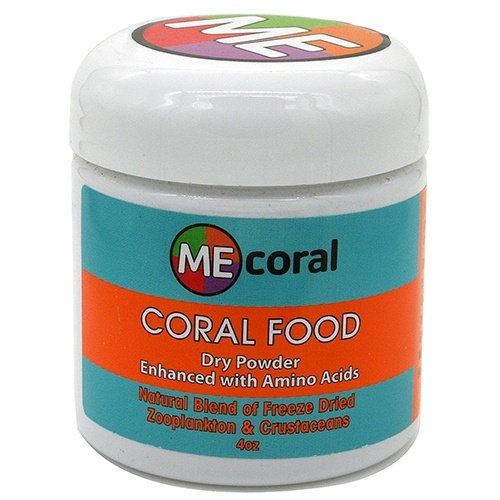 ME CORAL FOOD is a dry powdered coral food made from freeze dried Zooplankton and other crustaceous animals. No cheap fillers like yeast, soy meal, or fish meal. We only add beneficial Spirulina and Amino Acids, which help enhance coral coloration and growth. Coral Food is designed to feed all corals like SPS, LPS, Zoas, Chalice, Montis, Softies, Clams, filter feeders and small fish. No preservatives are added, as many contain phosphates. 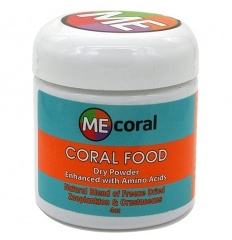 Your corals will thank you for using ME Coral Food! Research has shown that corals need energy for growth, coloration, respiration, reproduction, and mucus production. Sunlight or photosynthesis alone will not meet corals’ demand for energy. For corals to do best, we must provide them with food and nourishment similar to what is available in a natural coral reef environment. On the reef, corals consume suspended food particles or Dissolved Organic Matter (DOM), and Zooplankton. In our super skimmed and filtered aquariums, we are void of these foods, hence it can limit coral growth. Feeding Coral Food replicates what happens in the wild by adding Zooplankton and other high protein crustaceans which are rich in amino acids, protein, and fatty acids to the water column. Directions: Rehydrate (1/2 tsp per 100 gal) in seawater for 5 minutes. Pour into a high flow area of tank to get best dispersion. Can also be added to sump right before return pump and after filtration devices, so it blows into the system. Works best if skimmer is turned off, but not necessary. Can also be used to target feed specific corals with a turkey baster. Caution: Not intended for human consumption. Keep away from children and pets. If swallowed, do not induce vomiting. Drink water. Using in conjunction with ME Polyp Extender: Use ME Polyp Extender as indicated on bottle first. 15 minutes after adding ME Polyp Extender to the system, add ME Coral Food. This gives corals 15 minutes to exhibit a feeding response due to the amino acids they are eating. Now that they are feeding and extended, they have a more diverse food source to eat before it gets removed from our systems naturally. Tip: Corals can eat an enormous amount of food in a day. So overfeeding in theory can be a good thing for corals; however every system has different bioload and filtration system. Feeding should only be done to the point where our system can digest the food. In other words, if your system can’t consume all the food, it could break down into phosphates. Elevated po4 can cause unwanted algae growth. So use your test kit to determine if your feeding too little or too much.